This Christmas, don’t settle for the same old gifts. Discover amazing seasonal gifts to suit every budget and treat your loved ones to something special. Treat those with curly or delicate hair to the unbelievably gentle Lisse Luxe Hair Turban. Combining new generation Aquitex greatly improves both absorbency and comfort, whilst the easy-to-wrap design ensures your hands remain free as your hair dries. The super luxurious turban speeds up drying time whilst noticeably reducing frizz and damage. We couldn’t think of a better male grooming kit around. Comedically entitled ‘Below the Belt,’ this best selling grooming kit includes a post shower gel product (Fresh and Dry Balls) and a fabulous antibacterial and refreshing spray (Instant Clean Balls) for when he can’t get to the shower. Fruk loves this! Living amongst the smog of London is becoming increasingly detrimental which is why Boost Oxygen makes the ultimate Christmas gift. Breathing BOOST Oxygen will not only protect you against the harmful effects of air pollution. It also boosts your collagen and energy levels, mental awareness, immune system and alleviates stress. BOOST Oxygen has no artificial ingredients, caffeine or calories – making this an awesome present for anyone! BOOST Oxygen Beauty is a 98% pure portable canned oxygen with organic essential oil aroma of pink grapefruit. It is anti-inflammatory and will trigger the body’s natural healing function. Take this handy can with you wherever you go. On a night out this can will be a Godsend, being ideal as a preventative measure against the dreaded hangover. 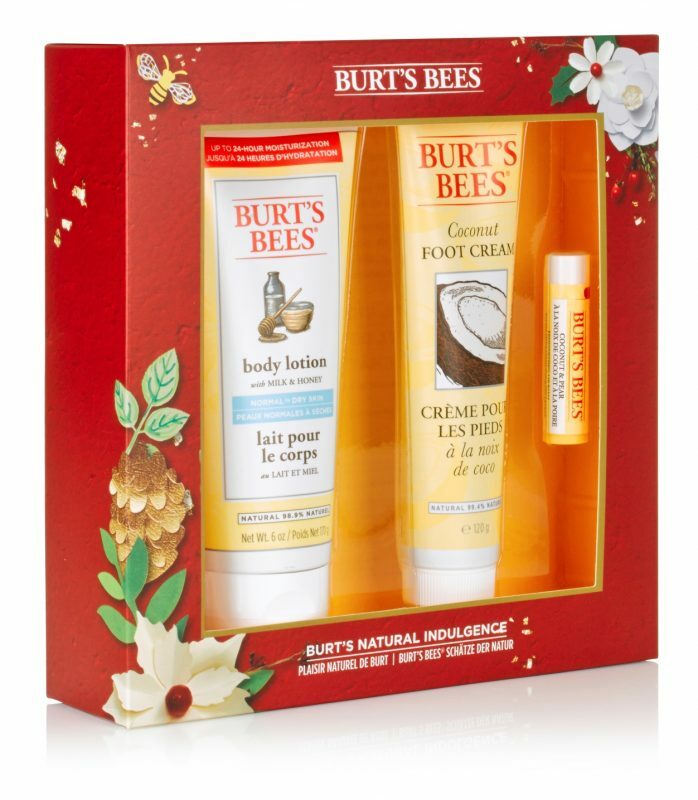 Burt’s Bees® Natural Indulgence Christmas gift set combines superior natural ingredients in a Milk & Honey Body Lotion, Coconut Foot Cream and 100% natural Coconut & Pear Lip Balm. These luxurious yet highly effective products containing hydrating and skin nurturing benefits make this gift set a much sought-after indulgent treat, that every man or lady would adore! No phthalates, parabens, petrolatum or SLS are included. What better gift than that of gorgeous skin? Sukin’s ‘Love Your Skin Pack‘, is a three-step face kit, including a cleanser, toner and moisturiser. Sukin has combined a rich blend of highly researched active botanicals and natural ingredients, thus ensuring your skin will feel thoroughly balanced, cleansed, hydrated and nourished. Sukin’s 3-Step Face Kit is suitable for all skin types. Having the right hairbrush for your hair type is essential and Lee Stafford’s superior hairbrushes make the perfect gift for those on a tight budget. The Daddy Brush is the perfect every day hairbrush designed to effectively smooth and soften with ease. Furthermore, it’s ceramic technology targets frizz, add shine and will even help to speed up hair drying time! The Big Smoothing Brush is ideal for creating smooth and silky tresses whilst its added ceramic technology works to prevent static. Lee Stafford’s round brush offers a soft grip handle ensuring total control as you style your hair. 7.L’occitane Luxury Beauty Advent Calendar, £89, uk.loccitane.com. December has just become the month of dreamy bliss for all beauty obsessives as L’Occitane has launched the best beauty calendar, ever! This holiday season you can pamper yourself or treat your loved one to L’Occitane’s Luxury Beauty Advent Calendar and rejoice each day at its wonder. So, take the ‘meh’ out of the Christmas countdown and swap the usual advent calendar for something that will truly be appreciated. Inside each door of L’Occitane’s beautifully designed calendar lies a precious gem of a gift that is guaranteed to make her smile. Each drawer opens to unveil fragrances, hand creams, special rejuvenating oils – all of which are infused with proven organic ingredients to nurture, pamper and rejuvenate. L’Occitane’s Advent Calendar also features a hidden surprise; turn the drawers around each day to reveal a Christmas illustration. Each drawer includes an awesome product such as a 5ml Terre de Lumiere Eau de Parfum, 4ml Divine Youth Oil, Divine Cream, Precious Cream, Almond Supple Skin Oil and many more delights. Let your loved one feel like an A-lister by gifting her to Rita Hazan’s Weekly Remedy Treatment. Do you know someone who permanently dyes or heat styles their hair? This is the go-to gift for people with severely damaged locks. This astounding 2-step hair treatment works instantly, repairing the hair from the inside out and ensuring locks are beautifully soft, manageable without a strand of frizz in sight for up to 24 hours. The lightweight mask guarantees deep absorption of conditioners and oils and lasting hydration, strength and colour protection. Rita Hazan’s Weekly Hair Remedy is suitable for all hair/skin types. Moroccanoil is one of our favourite brands due to the fact that it offers incredible results. Moroccanoil Treatment Light With Candle is an amazing gift particularly for those with fine hair. Moroccanoil Treatment Light’s organic nurturing and residue-free formula is highly beneficial as a conditioning, styling and finishing tool. This treatment blends seamlessly with other products and will speed up drying time so you can be ready for the Christmas party in half the time! Moroccanoil treatment Light’s formula provides outstanding hair transformation by transporting lost proteins for strength; fatty acids, omega-3 oils and vitamins for shine; and antioxidants for protection. Moreover, this product quickly absorbs to fill gaps in hair created by heat, styling and environmental damage. #Nomoresplitends!. This fabulous gift even comes with a free Moroccanoil Signature Scented Candle to help soothe away the stress of the day. Should you know someone who struggles with blemishes, gift them Esthederm’s l’Osmoclean and change their world. The Gentle Deep Pore Cleanser effectively removes impurities while taking care of the skin surface ecosystem. L’Osmoclean offers a clear, balanced and smooth complexion of utter radiance. Check out this hot pink coloured umbrella with a handle styled like a flamingo’s head, this beautiful bird will have your winter style not only stand out but also keep your loved ones covered all year round, come rain or shine this beauty is a gift that will always be remembered.